Features Slideshow, Top Navigation Bar, Custom Menu, Bookmark Ready, Auto Readmore, 2 Column, Food, Footer Columns, Pale, Red, Orange, White, Elegant, Fixed Width, 1 Right Sidebar etc. 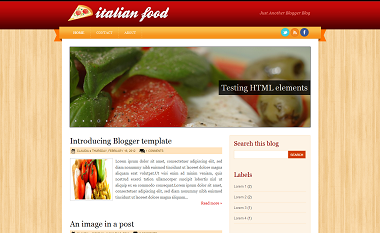 Italian Food Blogger Template is a food related Blogger Template.This template consist of Nivo Slider, PSD Logo and many great features. It has Slideshow, Top Navigation Bar, Custom Menu, Bookmark Ready, Auto Readmore, 2 Column, Food, Footer Columns, Pale, Red, Orange, White, Elegant, Fixed Width, 1 Right Sidebar, and many other features. This template is best for Food related blogs.